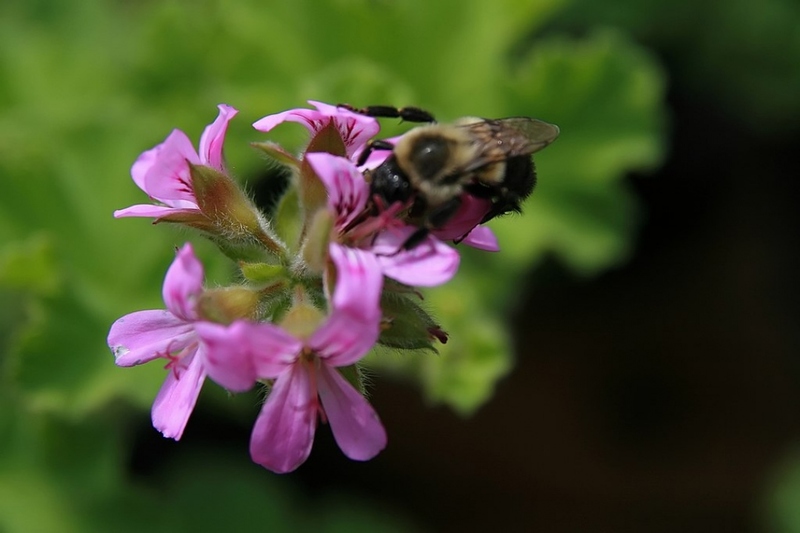 Citronella geranium (Pelargonium 'Citrosum'): growing, planting, caring. A pelargonium that smells of lemongrass. Small pelargonium with pink flowers with 5 petals that smells of lemongrass, and bears creased leaves, deeply cut. It can measure up to 0.4 m. According to a 1996 University of Guelph study, it has no mosquito repellent action ... too bad. Pelargonium - which most people mistakenly call geranium! - is a plant native to South Africa: it is not hardy in our temperate climates. It should not be confused with the true geranium, a perennial plant, completely rustic and grown in solid mass. These multi-colored herbaceous flowers bloom from April to October depending on the species. Their flowers are sometimes veined with a second hue. Pelargonium species with fragrant leaves, lemon or menthol fragrance are found. Sow between 13 and 18 ° C, sheltered in a bright place, between February and March. Fill containers with thin potting soil. Place the seeds one by one spaced 2 cm apart, so that the seedlings have enough space to grow, then cover with a light layer of potting mix and sprinkle finely with a sprayer. Seed emergence should happen a week later. Pelargonium likes a rich and well-drained soil. A month and a half after transplanting, your plants can be installed in their permanent pots. You can pinch the terminal shoots to help with branching. You should wait until late April or early May to take out the pots. Plant in pots of at least 3 liters, in a planter or in a pot, in a rich transplanting soil. The soil must remain well moist after planting. For plantations in open soil, wait until the last risk of frost is away and the soil is warmed up. Plant your young pelargoniums in finely worked planks (dug, scratched and raked). Prepare holes about 20 cm deep (depending on the size of the clump of your pelargoniums). Add some potting soil. Plant the pelargonium by compacting the roots well to avoid air, and barely covering the root ball. Water the foot well to facilitate rooting. In pot: Plant in a pot of at least 3 liters, in some enriched potting soil. The soil must remain well moist after planting. In the open soil: Wait until the last risk of frost is away and the soil is warmed up. Plant your young pelargoniums in finely worked beds (dug, scratched and raked). Prepare holes about 20 cm deep (depending on the size of the clump of your pelargoniums). Incorporate potting soil into the soil. Plant the pelargonium while around tamping around the roots to remove air, and just cover the root ball. Water plenty. When the plants have two pairs of leaves, between two and four weeks after planting, gently separate the seedlings and replant individually in individual buckets, with a mixture of soil and well-decomposed compost or potting soil. Water copiously, and do it every day during the first weeks. Repot each year by replacing some of the soil, or in a slightly larger pot. Natural Fertilization: put some compost around the plant, and lightly scratch the top to incorporate. Otherwise, use a fertilizer " special geraniums" every week from April to August. For land-based crops, watering is done only in the first weeks after sowing and planting. Watering after sowing is done in fine rain. Watering after planting / transplanting is done with a water jet or a watering cannula, taking care not to wet the leaves. Pelargoniums grown in pots or planters should be watered as soon as the soil dries at the top, knowing that the lack of water makes the leaves turn yellow but promotes flowering. Water in the morning. For plants indoors, be careful not to wet the leaves (this foster mushrooms), and put a cup under the pot. Multiply by herbaceous cuttings from March to October. Choose a healthy pelargonium. With a pruner, take a healthy, vigorous stem, not flowered, 10 cm long and 3 to 5 leaves long. Remove the largest leaves at the bottom. Fill a container with a mixture of peat and sand or a some special potting soil for cuttings. Water the mixture and wait until the water is well absorbed. Plant the cuttings, making sure they do not touch each other. Close the container with a lid or a see-through plastic bag and place it in the shade or indoors. When the cuttings have formed roots, after 8 to 10 days, replant them in individual buckets. During the winter, keep your cuttings in a dry, ventilated and frost free spot. They can be planted in the ground as early as spring. Bring in your Pelargonium, to a cold and bright room in October. As soon as the frosts are over, take out your pelargonium in full sun.